...with my boyfriend shorts, and a silk top. Sometimes I have on three different animal prints, without even thinking about it. Yeah, this totally works - you look awesome! I love these heels! The mix of prints totally works because of the subtleness or small doses. Ah, what a brilliant mix and it works so well:) Have a great day, lovely. You look great! The heels are nice too. Loving the print on the back! Love this casual chic look Lydia! So effortless and put together. What a great top and I think you totally made this work. Adorable! Love this mix! Those shoes are fab! Whooooooo! Loving the cheetah and snakeskin! I don't think I would have ever thought to put those prints together, but I LOVE it! Love this outfit! the heels are perfect!!! Love how you mixed the two animal prints! and nothing is better with boyfriend jeans than girly heels! Love this outfit! And you can't go wrong with mixing some animal prints. The heels just glam up this whole outfit! They are adorable! Wow! Three different animal prints?! That's amazing! You did a great job mixing the patterns. Whooee, you are smokin' in this lady! I love the mix of prints, and the shorts + heels combo is killer. Sometimes it works very well indeed! Personally, I think heels and denim shorts belong together. And this is probably my favourite pair of heels in your shoe collection, which doesn't hurt. But it's that simple silk blouse that really makes this look for me. It just look so effortless but the pattern is so subtly beautiful. Love, love, love! I LOVE that Gap clutch, Lydia! This is such a cute look! :) Fab photos, btw!! Gorgeous look. I think boyfriend shorts/jeans looks perfect with heels. That top is so pretty, I love the print! It totally works! I love boyfriend jeans/shorts with a good heel. The print on the top is great because it is subtle. Shorts and heels are my favorite! 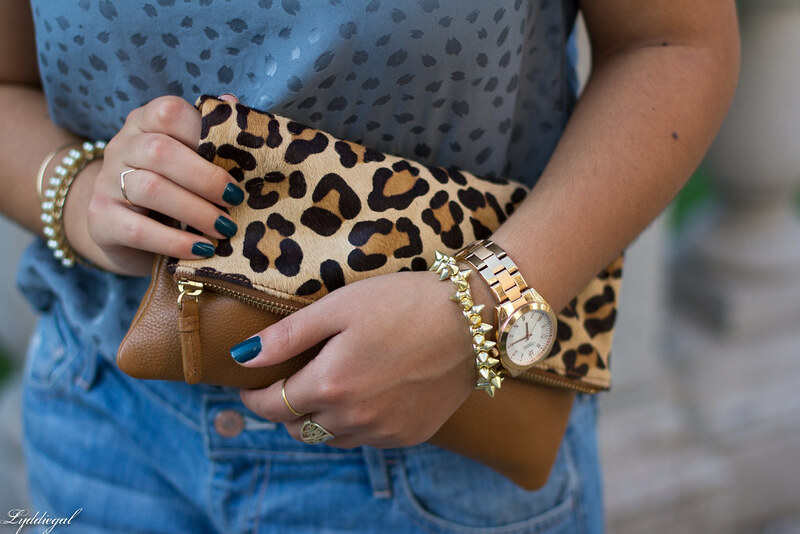 Love how you mixed the animal print! So cute! You're looking great. Love your top! I love everything about this outfit!! I have always been too scared to wear heels with shorts but you pull it off beautifully! !